Unexpected Moments of Mom Joy! - OMG Parenting!OMG Parenting! Unexpected Moments of Mom Joy! During my pregnancy, and heck, before my pregnancy, I could easily imagine the joys of parenting. From baby’s first smile to graduations, all those milestones! Not everyone who is pregnant is filled with these gushes of lovey-doves, but I was. And reality did not disappoint. I did delight in all of those milestones. And then, amazingly, I received delights in things I hadn’t anticipated at all; there was Mom joy that took me by surprise! The first was joy itself; it went to a whole new level. I’d felt joy before; in beautiful days, delightful outings, the myriad of little things that just take care of themselves. I’d felt utter joy when windsurfing. But honestly, the joy of my daughters’ laugh and just her being took me by surprise. I soared on it – best high ever! Discovering that I had that kind of joy in me was, well, amazing. The down side was, everything else paled a bit; it was harder for work to matter (for a while), life got automatically re-prioritized around home (for a long while) which was a little like tumbling down a funnel onto a small earth, and then other kinds of fun paled. Maybe I became a bit boring to my friends! Yet I was just thrilled that I had this new found level of joy powering all these changes. As time went on, I got into the swing of work days mixed with home life. Busy, busy. And yet, it was then that the second surprising joy emerged. Mommying required that I slow down; stop and smell the roses. It was like re-discovering the little things in life that are amazing. The ant crawling from one pile to another just MUST be observed, according to my daughter. The sound of the wind just MUST be paused over, again according to my daughter. The taste of yummy and beautiful looking food MUST be noticed, you got it, according to my daughter. It was like re-discovering my senses. What a gift! What joy they bring to my life. And they are free! That’s an interesting thing about joy, I’ve learned. It’s everywhere and free. I just have to tap into it. 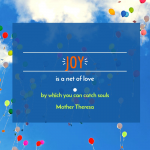 Even if life is in one of those oh-so-difficult phases, joy is there. Being a Mom makes it easier for me to find, though. There was the Christmas when my daughter was 2 years old. Holding my hand, we walked down the stairs together, she with her eyes closed because I wanted to surprise her with the tree lights. When she opened her eyes, saying “ohhhhhhh” as she just kept turning in circles, whole self filled with wonder… a moment of joy for sure. The Halloween she and a bunch of her friends went whooping out the front door, down the street, full of tween energy. Their laughter and spirit filled me (and the air) with joy. Those times, hearing her and her friends talking it up with different accents, playing different characters as they unfolded some imaginative plot line. Joy pops! The moment I saw her when she arrived at the airport, back home from her trip abroad with other high schoolers. Yep, Mom joy! Joy. I saw this great quote from 20th century poet, W.H. Auden: “In times of joy, all of us wished we possessed a tail we could wag.” If you have a dog, you can relate to that! Tail wagging moments are one of the gifts parenting has given me. In the scramble of life, it used to be easy to forget they occur. My daughter has taught me to stop and relish them. So take some time and share with us your more recent tail wagging parenting moment. We may not wag our tales at you, but it will have us smilin’!